If you’ve been following this series of best Google Plus real estate articles over the past couple years here on Mass RE News, than you probably realize that G+ is a great platform for finding excellent real estate content. If you haven’t read a previous round-up of the best of Google+ articles, welcome and be prepared to be impressed by some well thought out and detailed posts. Below you will find 10 of the best real estate articles from the past month that have been shared on Google+. It’s a guarantee that you will find at least one of the articles below that interest you and that you find helpful. 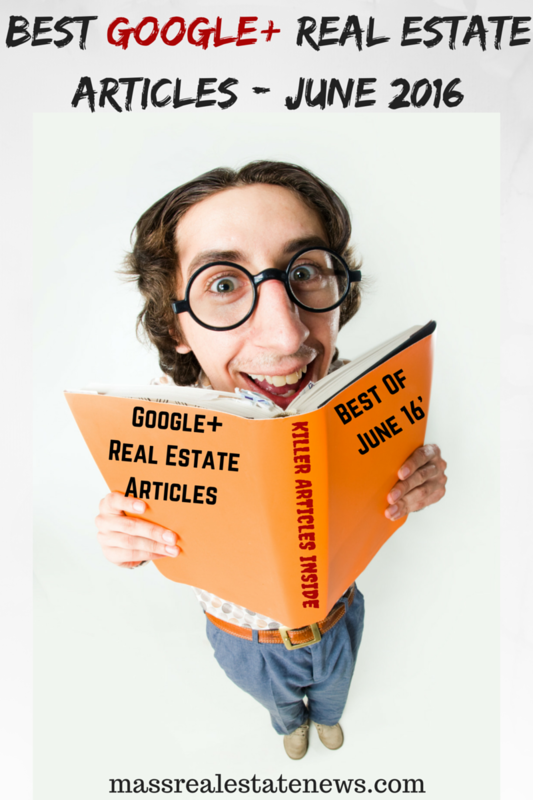 If you do find the best Google+ real estate articles from June 2016 helpful please consider sharing them! Joe’s masterpiece not only combines brief recaps of some killer real estate blogs but also has some incredible graphics that make the user experience a memorable one. In Joe’s round-up you will find articles from some of the best real estate bloggers, many of which have been included in previous best of G+ recaps. Just to give you an idea of some of the heavy hitters included in Joe’s recap…Debbie Drummond, Lynn Pineda, Anita Clark, Ryan Fitzgerald, Paul Sian, Bill Gassett, and many others…need I say more? What are you waiting for? Go check out Joe’s incredible round-up of some of the best real estate blog articles now! Have you ever heard of a “Gifographic?” If not, you need to check out this incredible article and gifographic written by Nathan Garrett. Nathan provides some excellent tips for buying your first home as well an eye catching and animated graphic. Nathan provides some tried and true tips for buying a home for the first time such as the importance of hiring a top buyers agent, getting pre-approved before shopping for homes, having a home inspection, and a variety of other tips. Another great article from the past month that was posted over on Google+ was this article written by Bill Gassett that provides some great information on how to take down wallpaper and some of the reasons why it’s a smart idea when selling a home. Wallpaper was a very popular trend in home decor, decades ago. The reality is that the majority of home buyers today don’t want wallpaper in their home and don’t want to take the time (or have the time) removing it. Bill provides some great tips for identifying the type of walls your home has, as well as tips for removing wallpaper. There is also a great video that provides some great advice on removing wallpaper, so if you’re selling a home and have wallpaper, make sure you check out this excellent article. When selling a home, having strong curb appeal is undoubtedly one of the most important things to make sure your home has. Luke Skar of Inlanta Mortgage has created a series of articles over the past year that provide some excellent tips for improving curb appeal for each season. Luke’s most recent article completes the series and certainly the summer edition for improving curb appeal was nothing short of spectacular! There are specific tips for improving summer curb appeal that Luke covers in detail and also some insight from some of the top real estate professionals across the world. By following these curb appeal tips, you are sure to “turn ordinary into extraordinary,” which is certainly what every home seller should be striving for when selling their home during the summer. It’s 2016 and websites that only have boiler plate information about real estate and an IDX feed simply will not “WOW” consumers. After all, isn’t the purpose of having a real estate website to educate local buyers and sellers about real estate and about your local community? Real estate websites need community pages if they are going to make a positive impression on local residents, period. In this article from the YPN Lounge, Realtor.org’s blog, you will discover why real estate community pages are necessary, what community pages should include, how to get community pages noticed, as well as some information as to why they are beneficial for a real estate website. If you’re in the process of building a real estate website or have had one but don’t have community pages, you need to read this article. The time spent on creating a detailed community page will minimal when comparing to the long term results a community page can provide. Another great article from the past month from Google+ comes to us from a fairly new real estate blogger, Conor MacEvilly. While Conor maybe fairly new to the blogging world, the article he wrote discussing reasons why sellers should complain about Realtors® but don’t, would make you think he has been blogging for decades! Conor discusses some of the most common reasons sellers should complain about real estate agents but don’t, such as poor real estate photos, tipped over for-sale signs, terrible real estate descriptions, and a variety of others. Since selling a home is one of the biggest transactions in a person’s lifetime, it’s critical sellers hire a top agent and be on the lookout for some of the things Conor talks about in his article. Difference Between Appraisal and a Home Inspection? Yes, there is a difference between an appraisal and a home inspection. Many buyers and sellers don’t realize that this is the case and are surprised when they learn that they are very different. A real estate transaction has many steps and stages and the inspection and appraisal are two very important ones. In this article from my website, Rochester’s Real Estate Blog, you will learn what an appraisal and an inspection are as well as some of the major differences between the two. Certainly there are some buyers and sellers who understand the differences and the topic may seem silly, however, there are many who have no clue that they are different. One of the most difficult steps to selling a home is actually receiving an offer that is acceptable. Once an offer is accepted, this does not mean that you can start singing all the way to the bank, because there are many things that can happen between acceptance and closing. Many of the reasons why real estate transactions fall apart after accepting an offer are because a seller does something silly. If you’re wondering how to blow up your home sale (or hopefully how you can avoid it), this article written by Karen Highland is a must read. Karen explains that not being flexible with negotiations and ignoring contingencies are two great ways to implode your home sale. Be sure to check out this article to ensure you’re avoiding things that can jeopardize your home sale! A topic that has been written about hundreds of times relates to picking the right Realtor®. This topic should be written about hundreds of more times too, because the importance of picking the right real estate agent cannot be overstated. The next article from the past month over on G+ comes to us from Paul Sian. Paul provides some killer tips for picking a great Realtor® such as reviewing their past work and checking out their presence on social media and the internet. By following the tips outlined by Paul in this article, it greatly improves the chances that you hire a top real estate agent to sell your home, so check it out! It’s very common and encouraged to ask questions whether selling a home or buying one. One of the biggest mistakes that consumers make when being involved in a real estate transaction is they don’t ask questions because they feel silly. No question is a silly question, remember that! In this article from ActiveRain, you will find out 10 FAQs about selling a home. Questions such as; “How do I choose a real estate agent,” “What are the costs of selling a home,” and “Should I sell a home empty or staged” are all very good questions that sellers should not be embarrassed to ask. If you’re selling a home make sure you check out this excellent article that provides answers to 10 of the most common home selling questions and if you don’t see a question on here you have, make sure you ask your real estate agent. Did you enjoy the best of Google Plus for June 2016? Are you interested in checking out some more great real estate content? Take a look at some of the best real estate bloggers in 2016 put together from Fit Small Business. These are some of the best bloggers from around the country with each have a highlighted blog article! Kyle Hiscock is a top Rochester NY Realtor® with Nothnagle REALTORS®. He actively writes helpful content on his popular Rochester Real Estate Blog, and is passionate about staying up-to-date on the Rochester real estate market. Be sure to follow Kyle Hiscock on Google+!